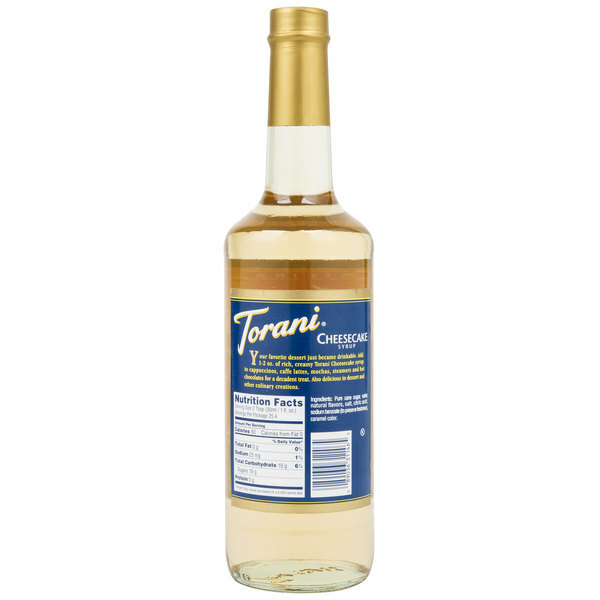 Bring all new flavors to your specialty drink menu with this Torani cheesecake flavoring syrup! This tempting flavor will complement your beverages without overpowering them or being too sweet, while the user-friendly bottle will be convenient for your busy baristas to use. Torani flavoring syrups are specially formulated to resist curdling in milk and to hold up well under heat, making them the perfect choice for espresso-based drinks, brewed coffee or tea, and more. Use this flavor for frappes, iced coffees, smoothies, and even baking! Combine the rich, decadent taste of an irresistible cheesecake dessert to any drink with this cheesecake flavoring syrup! Discover new Torani recipes for this flavoring syrup, including cheesecake cappuccino, cherry cheesecake latte, frosted cinnamon roll latte, white chocolate cheesecake mocha, and more! Cheesecake is a huge seller for us in milkshakes! We love being able to pump a couple pumps of the Cheesecake Torani and add a couple pieces of cheesecake bites to create the most delicious cheesecake flavored milkshake! Perfect for cheesecake milkshakes! Add it with some strawberry and you can make a really good strawberry cheesecake milkshake. Has a good taste and good quality. 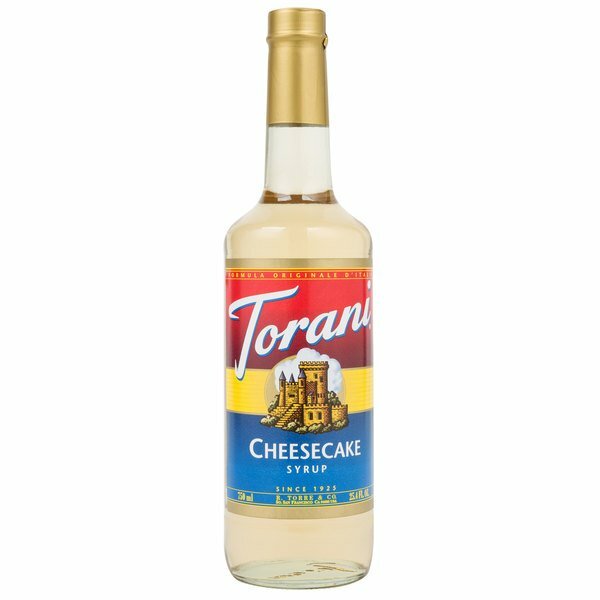 I can not say enough about the Torani Cheesecake flavoring. Our guests can not get enough of it. Our favorite is Red Raspberry Cheesecake White Mocha. Get some! Cheesecake by itself is becoming a go to flavor for those who want something different in espresso and hot chocolate drinks. The pumpkin cheesecake hot latte is my winter hit. My husband loves blueberry cheesecake iced coffee. This is the perfect syrup for iced coffee. I use 2 oz of cheesecake syrup, 1 oz blueberry infusion, 1 oz milk 8 oz cold coffee pour over ice in the blender and blend well. He has had this every morning for months and now I am ordering 6 more bottles. This mild cheesecake flavoring is great when mixed with another flavor especially strawberry. Make a frozen drink with this and you feel like you are drinking cheesecake! Very sweet, not much like 'cheesecake' but definitely a sweetener. It is only slightly different than vanilla. Slightly artificial tasting. Not going to buy again. Running a yogurt store, this Torani syrup has made it even easier to provide the customer's most favorite flavor...cheesecake!! The screw off top makes opening it for a serving and closing it back up effortless. I have never had an issue with the product going stale or not being able to use it after a few months. Definitely recommend it! WOW. Just like having a fresh slice of cheesecake! Torani has such a fantastic selection and this flavor is great and does not taste artificial. The Torani Cheesecake syrup was pretty good. I purchased it to have variety on our coffee bar. While it was good, it just didn't bowl me over. However, that's just me and I would recommend people to try it at least once. It is a Torani product after all. Cheesecake froyo is one of our best sellers! We love using torani brand Cheesecake to make it because of its strong flavor! We love that our customers love topping it with cheesecake bites to make it the perfect cup as well! I love Torani flavoring syrups. The Cheesecake flavor blends well into creamy thick milkshakes and pairs nicely with other flavors like blackberry, cherry, or raspberry. The Cheesecake syrup is delicious when paired with another flavor (especially strawberry or cherry!) However, it doesn't work well in hot or cold drinks by itself. We mostly use the Cheesecake syrup at our shop for our Strawberry Cheesecake milkshakes. The flavor has a strong taste so It does not take a lot, but sometimes It may seem too strong to some people.